Among the diverse selections of the 75th Venice Film Festival is an adaptation of a short fiction by Portuguese poet Fernando Pessoa. Il Banchiere Anarchico (The Anarchist Banker) is the story of a banker who engages in a revealing conversation about why he considers himself an anarchist even though he doesn't possess the obvious traits. Published in 1922 and set in a Lisbon café, the conversation takes place between a wealthy banker and his friend as the two have a friendly but passionate exchange about the qualities of a true anarchist. The wealthy banker stands by his claim that he is the only true anarchist left and makes a compelling and at times surprising argument to back his belief. I spoke with the creator of the film, Giulio Base for some insight into this story and why a piece of literature written nearly a century ago is still very relevant today. Let's just start at the beginning. Why did you want to adapt this story for the screen? I love Pessoa. More than that: I adore him, I venerate him. And this literature is more or less my ‘life statement’. With all the political turmoil these days, the story of an anarchist is certainly relevant. How do you feel it applies to contemporary life in 2018? The tale was written in 1922, but as all the masterpieces, it is timeless. What is impressive is how important bankers are today. They are on the front pages of every newspaper. So, the mind of this poet was visionary. Is the story a complete fiction or was Fernando Pessoa writing about himself? Totally fiction, but Pessoa always put a bit of himself in his works (who doesn’t?). I read that you have also portrayed this character on stage. In interpreting the primary role of the banker, what qualities in him did you identify with? As the tale’s banker, I love to wake up early, go to bed early. Work without pause, keeping in mind that fame is not important. Freedom is. Do you feel that people should read the story before seeing the movie, or can someone walk into the theater and follow the movie without knowing the story? I tried to make a movie as a cultural message. I read the book for the viewer, I represent it as if it was real life. For the joy of literature I suggest to read it but it’s not necessary to get into the movie. Base will present his film in the Sconfini program on September 7 at 9:00am. 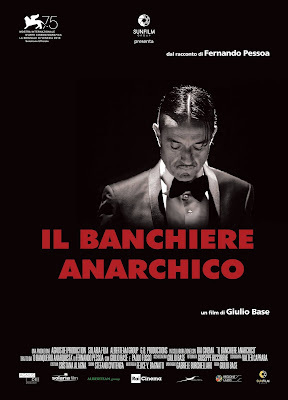 Click here to read The Anarchist Banker. Click here for more information about the screening in Venice. The film will be released in Italy following its premiere at the festival.